We've all heard it before. Perhaps at the glance of an untidy bedroom, or even on a television sitcom, the ‘looks like Beirut’ jibe has widely become a common phrase to denote a chaotic mess. Once dubbed the ‘Paris of the Middle East’, Beirut received its warzone reputation as a result of the 1975-1990 Lebanese Civil War that effectively turned the city to rubble. Two decades later, and despite the complete restoration of downtown Beirut, the phrase still persists in certain international corners, to the frustration of some Lebanese and Beirutis. Thus, a Twitter and blogger stir was caused last week when a headline in Australia's The Age newspaper invoked the infamous phrase. Titled “Suburban street like ‘downtown Beirut’ after shooting, firebombing”, the article refers to a criminal shooting allegedly involving Lebanese Australian gangs. The ‘downtown Beirut’ reference was quoted by a witness and local resident, and sensationally deployed by The Age as the story's headline. @matthewteller: @justimage @antissa Headlines & standfirsts notoriously prone to be disconnected from articles. Happens all time. This egregious example. It also caught the attention of Lebanese blogger and Beirut resident Jad Aoun, who has taken it upon himself to track global media negatively referencing the ‘looks like Beirut’ phrase. As a means to correct the false and outdated association of Beirut with war, Aoun launched the Look Like Beirut Awards, whereby a certificate is posted to the individual who has used the phrase. Have a look through the archive and see for yourself how many people compare Beirut to destruction. Over 120 recent uses since January 2009, and still counting! So since Andrew has no last name and there are no further details on him, I will be sending him his Looks Like Beirut certificate via the journalist Paul Millar. I’ll also be including an additional certificate for Paul in recognition for that spectacular title for his article. Aoun went on to post an email exchange he had with The Age journalist Paul Millar regarding the derogatory reference to Beirut. 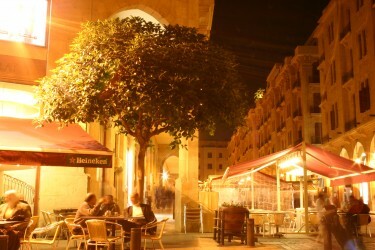 Thank you for shedding light on what “downtown Beirut” looks like – we Lebanese bloggers have found your latest article very fascinating. So much so that I’ve decided to (snail) mail youa “Looks Like Beirut” Certificate for your hard-work and dedication in keeping the out-dated cliche “looks like Beirut” alive. I understand that the phrase was used by Andrew Anonymous but the fact that you had to title your report with it speaks magnitudes to your dedication to the phrase. I would appreciate it if you can also pass on Andrew’s certificate to him as well since he decided to remain in the shadows. In the event you are interested to see what downtown Beirut currently looks like, I have some photos available on my blog. You should receive both certificates by mail soon. Hi, as I said to your friend, reporters do not put headlines on stories. Hope this clarifies your misunderstanding. Is it me or is there some type of disconnect between my email and his response? Paul, I apologize that I failed to read your job description, I should have known that you do not do titles – I mean they need to be handled by more responsible people I guess. Nevertheless, the certificates have been sent out though I expect you to shred them as soon as they land on your desk. Social media campaigns have previously proven effective in changing one's perception. Aoun's efforts to educate those unaware of Beirut's transformation has won the applause of the Lebanese blogger community tired of the war-like connotations. Aoun remains prepared to send as many Look Like Beirut certificates as necessary. Paul Millar should be receiving his in the coming days.